A final proposal to emend the Byelaws is here presented to the Community for vote (according to §9.4 below). The changes are the same as those reported previously (see Proposed Change to Byelaws), the essence of which is to remove references to ‘wiki’ in order not to be dependent on any single technology, since this will necessarily become outdated in time. The Community is now requested to vote on these changes. If passed by a two-thirds majority of voters then the Byelaws will be emended according to §9, below. Voting should be conducted by clicking on the ‘Click Here to Vote’ button below. Voting closes at midnight GMT on 11 June 2014. The name of this organisation is ‘Digital Medievalist’ (hereafter abbreviated ‘DM’). The primary purpose of DM is to be an international community of practice supporting ‘digital medievalism’, which is understood to be an interest in the creation, use of, or research using digital objects relating to the Middle Ages. To provide an online mailing list (dm-l) as a forum for members of DM to discuss digital medievalism. 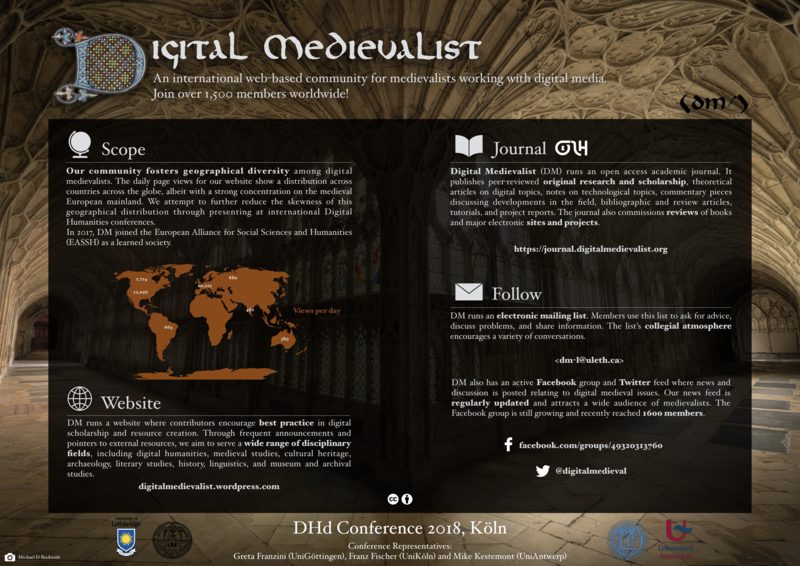 To publish a free online open-access peer-reviewed journal entitled ‘Digital Medievalist’ as a high quality publication of work of interest to digital medievalists. To host a wiki to record information online information resources of use to digital medievalists. 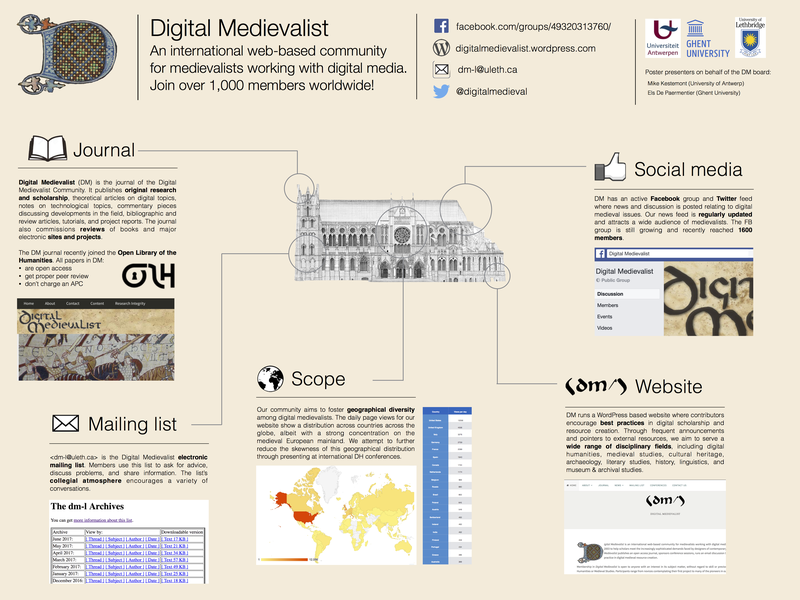 To organize events of interest to digital medievalists. For example, occasional conferences sessions as an outlet for scholarly discussions of interest to digital medievalists. To undertake other activities relating to its purposes and objectives or the promotion of DM as a community. DM shall be a non-profit organisation, any funding received will be used to enable DM to further its purposes and objectives. Membership in DM is open to anybody interested in its goals. Membership is conferred by subscription to DM mailing list (dm-l). Subscription to the DM mailing list, and therefore membership in DM, may be suspended or revoked by the Director or his/her delegate (subject to confirmation by the DM Board) for inappropriate behaviour on the list. A person whose membership has been suspended or revoked for cause must reapply to the board for readmittance. Individual members have the right to vote in DM elections and such issues as the board shall decide to poll the membership on. Members who meet additional eligibility criteria (see below) may stand for positions on the DM Board. The DM Board shall elect a Director annually from its ranks (see below), and appoint subcommittees and officers as necessary for the efficient running of the project. A moderator/moderators for the dm-l listserv. An editorial committee responsible for the production of the DM journal. An editor or editors responsible for overseeing the operation of the DM wiki online information resources of use to digital medievalists. Membership on these committees need not be exclusive: individuals may serve on more than one committee and the board may assign all tasks to a single executive committee if it sees fit. The DM Board may delegate these tasks to participating members and others if it sees fit, although it shall retain final responsibility for all decisions. The DM Board shall consist of eight members, with each member elected for a two year term. Terms on the DM Board shall be staggered so that four positions are open for election each year. Elections shall be held annually. Any ties in voting shall be decided by the existing DM Board members excluding any who are standing for re-election. No member may be elected to the DM Board for more than three consecutive terms (six years). After three terms, the member must wait at least one year before becoming qualified for re-election to the DM Board. DM Board members may resign from their commitments at any time but are expected to give adequate notice. If the resigning member has served less than 50% of his or her original term, the DM Board shall hold a special election. Members appointed or elected to replace a resigning member will serve for the remainder of the original member’s term, at which point they will be eligible for re-election. They must be members of DM. Non-trivial editing or page creation for the DM wiki online information resources. Inclusion in a sanctioned DM event (such as presenting in a conference session sponsored by DM). Publishing of an article in the DM Journal. Equivalent contributions (to be considered at the time of candidacy). Potential candidates are responsible for providing evidence of appropriate contributions to the project if requested by the DM Board. The DM Board will elect a Director annually from among its members at the first meeting after the annual elections. Re-election is permitted, though no member may be elected as Director for more than six consecutive terms (six years). After six terms, the member must wait at least one year before becoming qualified for re-election as Director. A vote of non-confidence in the Director requires a two-thirds majority of the entire DM Board. After a successful vote of non-confidence, a new Director shall be chosen to serve out the remaining term from the DM Board membership. A vote of non-confidence in the Director does not affect his or her membership on the DM Board. The Director will convene, determine the agendas for, and chair meetings of the DM Board and its subcommittees. He or she will also be a member ex officio of all such sub-committees as the DM Board shall constitute. The Director may delegate these tasks. Executive decisions made by the Director can be overturned through a two-thirds vote of the DM Board. There shall be an e-mail mailing list hosted by DM which shall serve as a forum for discussion by those interested in digital medievalism. The DM mailing list shall be open to anyone interested in digital medievalism. There shall be a journal of record overseen by the DM editorial committee which shall publish worthy articles of note. The focus of the journal shall be of research in the use of digital media that is of interest to medievalists, regardless of whether this research is focussed specifically on medieval projects. The editorial committee will be appointed by the Director on the advice of the board. There shall be a wiki online information resources hosted by DM in order to act as a repository of information collected and edited by the membership. These may be implemented in the form of a wiki, blog, or other technology as deemed appropriate by the Board. The Director will appoint administrators for the wiki information resources as and when they are needed. Anyone wishing to provide useful contributions to the wiki information resources will be allowed to. Disputes concerning edits of the wiki content will be settled by the wiki administrators of the resources and by appeal if necessary to the DM Board, whose decision will be final. There shall be a wiki hosted by DM in order to act as a repository of information collected and edited by the membership. The Director will appoint administrators for the wiki as and when they are needed. Anyone wishing to provide useful contributions to the wiki will be allowed to. Disputes concerning edits of the wiki will be settled by the wiki administrators and by appeal if necessary to the DM Board, whose decision will be final. DM will organise events befitting its mission, such as conference sessions at important relevant conferences. DM should not be held responsible for any financial obligations resulting from the organisation of such events. Although events will usually be organised by members of the DM Board, the DM Board may appoint delegates for particular events. Amendments to these bylaws can be composed by the DM Board and become proposed amendments with a simple majority of the total DM Board membership. Proposed amendments will be published on the DM mailing list (dm-l) and the DM website with a minimum 10 day period requesting comments by the DM membership. The DM Board will discuss comments on the proposed amendments received from the DM membership incorporating changes agreed by a simple majority of the DM Board. The agreed version of the amended bylaws will be presented as a whole to the DM membership for voting over a minimum 7 day period. The amended version of the bylaws will pass with a two-thirds majority of votes recorded during the voting period.